What are the options for Polo shirt collars? Polo shirt collars are key to the overall look. It is the one feature that sets it apart from a regular t-shirt and is what gives it that all important smartness and structure. knitted collars are the most popular choice. They are woven in the same yarns as the main body and are dyed to match. The great advantage of knitted collars is the ability to knit patterns and contrast colours into the collar. 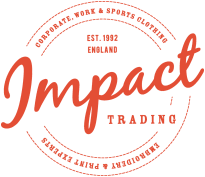 This can add interesting details that can enhance and help project your brand image. Self fabric collars are made from the fabric that is used in the main body and sleeves. It gives a more tailored appearance and is a good way of keeping the colour consistent. Contrast collars have a more tradition feel. They reflect the style of the original polo shirts that were used by the british military to play Polo. Cotton is used in different colours to create a classic ‘sports club’ feel. A simpler denim contrast can create a more contemporary feel. 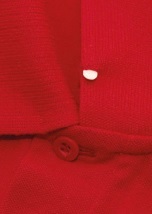 Plastic tipping – A great new invention for keeping knitted Polo shirt collars neat by preventing curling. We think this is a great idea! Especially when you consider that office wear is becoming increasingly more relaxed. This is a great way of ensuring that a polo shirt collar sits neatly under a jacket. The Plastic tip is inserted into a channel down the front of the collar, to keep it straight. It can easily be removed when washing the garment. Ottoman detail on knitted collars – what are the benefits? 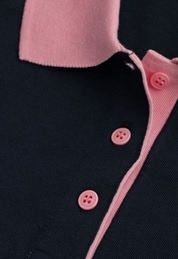 On heavier weight styles, particularly our work wear polo shirts, the collars have an Ottoman detail knitted along the outer edge of the collars. 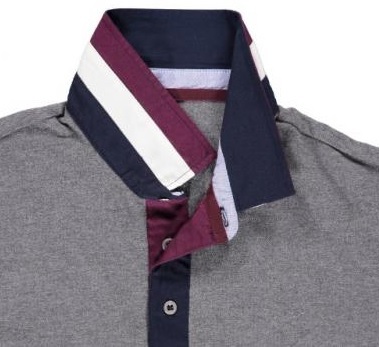 This gives an attractive edge to the collar and more importantly adds rigidity to prevent rolling. We have recently introduced a more fashionable range of polo shirts where a slimmer fit and a narrower collar are key features. They are an ideal choice for retail and hospitality, particularly for a younger and more modern environment.